With the 2018 NHL Draft around the corner, mock drafts are popping up all over the place. The staff at THW have decided to do a mock draft of their own led by one of our draft prognosticators and credentialed writers, Mark Scheig. The team at THW went through the first two rounds of the draft totaling 62 picks. For mock draft purposes, no picks were traded. Full results for the THW mock draft can be seen above. Without giving too much away, the Vancouver Canucks were able to secure an NHL-ready asset that will be able to help their club immediately. Here’s how the picks shook out prior to the Canucks getting to the podium. It’s no surprise that Rasmus Dahlin, Andrei Svechnikov, Filip Zadina, and Brady Tkachuk went in the order that was projected within the top four of the draft. The most interesting aspect is how players will go from the fifth pick onwards. The big focus is on that group of talented defenseman in the tier below a generational star like Dahlin. In the THW mock draft, Adam Boqvist was the first defenseman off the board after Dahlin. Boqvist went to the Arizona Coyotes, and the Detroit Red Wings (likely how it’ll be on June 22) wasted no time taking Evan Bouchard next. That leaves Canucks general manager Jim Benning with plenty of options with the No. 7 pick. If Benning and the Canucks don’t end up trading the No. 7 pick to the Carolina Hurricanes as part of a package for defenseman Noah Hanifin (as rumored), they’ll be in a prime spot to add a great piece. 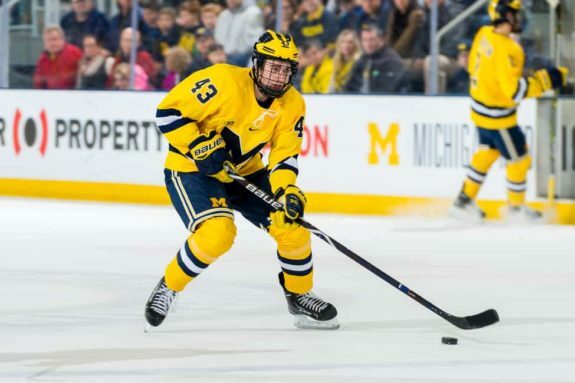 With the seventh overall pick in the 2018 NHL Draft, the Vancouver Canucks are proud to select from the University of Michigan defenseman Quinn Hughes. Hughes projects to become a top-pairing defenseman in the not so distant future and would anchor the Canucks blueline. He’s the pick Benning, and the fan base wish Olli Juolevi would become, but that’s looking like a pipe dream and a long-term project. Luckily, Hughes is seen by most scouts to be NHL-ready. His numbers in the USHL (0.62 points-per-game) were better than Seth Jones (0.54), and Charlie McAvoy (0.51). Comparing draft years with another NHL stud, Zach Werenski, Hughes again posted better numbers. He put up five goals and 29 points in 38 games to lead his team in scoring by a defenseman. Hughes might have the highest offensive upside in the draft along with Dahlin, Boqvist, and Bouchard. He’s a tremendous skater, has great offensive awareness, and can dictate the pace. People notice Hughes when he’s on the ice like most of those guys mentioned above that are already playing in the NHL. Hughes was excellent for the Americans at the 2018 World Championships as an 18-year-old. He held his own and did well regardless of only having just two assists in ten games. The American also had a great showing at the World Juniors winning a bronze medal. He may only be 5-foot-10 and 175 pounds, but this kid can flat out skate and assert himself. Don’t let the size factor scare you off, especially considering another fair comparison in Ryan Ellis of the Nashville Predators. ISS Hockey also projected Hughes to go seventh to the Canucks. While fans have suffered through some disappointing few seasons, Benning has been assembling an army of prospects that are slowing trickling into the Canucks lineup. If the Canucks are lucky to have Hughes trickle down to them past the Coyotes and Red Wings they’ll be counting their lucky stars. Hughes should replace Alex Edler as the Canucks top defenseman in a few years, and will likely have a higher upside than Juolevi. He could jump right into Vancouver’s lineup and play top-four minutes unless he confirms he’s committed to Michigan for the 2018-19 season. He joins a very elite core of prospects put together by Benning and his scouting staff. Hughes, Juolevi, and Guillaume Brisebois are the most promising blueliners in the organization. Among those three, Hughes could become the club’s No. 1, Juolevi (if he gets back on track) a No. 2, and Brisebois a No. 4. Drafting Hughes will give plenty of hope to a Canucks fan base. Up front, the Canucks have a tantalizing core that’ll soon join Brock Boeser and Bo Horvat. Elias Pettersson, Jonathan Dahlen, Kole Lind, and Jonah Gadjovich are on the way. Then there’s Thatcher Demko and Michael DiPietro between the pipes. Rest assured Canucks fans this is the year to grab a defenseman with the No. 7 pick. Take Hughes and let the assets mature. There’s a bright future coming together for Canuck fans who have been waiting since 1970 to win a Stanley Cup. The Canucks got a good offensive defenseman in the first round, in the second they’ll add an underrated two-way forward that could develop into a top three center down the road. An eventual top nine that might include Elias Pettersson, Bo Horvat, Brock Boeser, Jonathan Dahlen, Adam Gaudette, and McShane would give Vancouver a solid foundation to build upon for their future. A handful of desirable pieces went just before Vancouver’s selection at No. 37. Ty Dellandrea is one of those desirables and had similar numbers to a top-15 favorite Barrett Hayton. In McShane’s benefit, he’s more than just a consolation prize because his offensive production exceeded Hayton’s and Dellandrea’s. He was ranked 33rd on NHL Central Scouting’s mid-term rankings and slipped to 50th on their final list. He’s also ranked 64th by Future Considerations. Thus this pick might seem like a bit of a reach by most scouts and draft prognosticators, but it’s a worthwhile investment. Most of the industry has McShane in the second round with some having him early in round three. He checks in at 31st overall on my list, the last pick of round one. I think he has enough of an overall game to warrant selection this high. His offense is great and will only get better with more consistency. 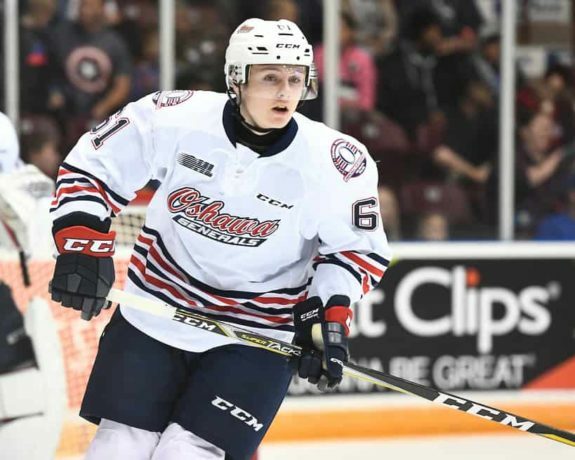 He’s one of the best playmaking centers in the OHL. McShane has top-six potential, great offensive potential, and can play all three forward positions. It’s possible he makes the shift to the wing when he turns pro. Adding him to the group listed above gives Vancouver a very well rounded prospect base. Benning might not be a popular GM amongst a portion of the fan base that’s grown impatient, but this club is coming together the right way. In a few years, believe it or not, they’ll be where the Winnipeg Jets and Toronto Maple Leafs are. Patience – it’s a beautiful thing.